How does limb regeneration work in animals like salamanders? If you cut off their tails, they are able to completely recreate the missing limb, including bones, muscle, skin, blood vessels and nerves. In salamanders, new tissues come from a tumorlike mass of cells that forms at the site of the injury, called the blastema. Until now, most scientists thought that the blastema contained a population of stem cells that had become pluripotent--capable of giving rise to all the needed tissues. However, new research published in Nature seems to indicate that the mechanism is simpler than previously supposed. An experiment designed by Elly Tanaka at the Center for Regenerative Therapies, in Dresden, Germany employed a new method for tracking what happens in the axolotl when it is injured. 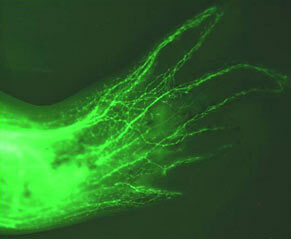 The researchers first created transgenic axolotls that carried green fluorescent protein (GFP) in their entire bodies. When the animals were still embryos, the researchers removed a piece of tissue from the limb region of the transgenic animals and transplanted the tissue into the same location in nontransgenic axolotls. The transplants were incorporated into the growing body as normal cells, and when the limb of the transplant recipients were then severed, the researchers could track the fate of the fluorescent cells as the limb regrew. The researchers used this method to track the fate of cells of the inner and outer skin, muscles, and cartilage, as well as Schwann cells, which insulate nerve fibers. They found that, contrary to previous evidence, muscle cells at the amputation site only become muscle cells in the new limb. Other cell types also stuck to their previous identities; the only exception, Tanaka says, is that cells of the inner layers of skin and cartilage seem to be able to transform into one another. "Even in defeat," Edric said, "your father's Sardaukar did not abandon wisdom. Let us suppose a wise Sardaukar commander recognized the swordmaster in a corpse his men had slain. What then? There exist uses for such flesh and training . . . if one acts swiftly..."
...Edric said. "...let us assume that our wise Sardaukar commander had Idaho's corpse preserved for the axolotl tanks.